In recent years, scholars from a variety of disciplines have addressed many perplexing questions about the Industrial Revolution in all its aspects. Understandably, economics has become the focal point for these efforts as professional economists have sought to resolve some of the controversies surrounding this topic. 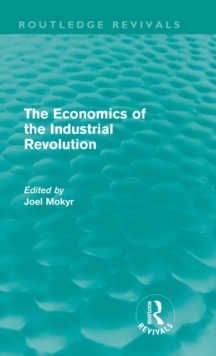 First published in 1985, this collection contains ten key essays written by leading economists on the subject of the Industrial Revolution. Among the questions discussed are the causes for the pre-eminence of Britain, the roles of the inputs for growth (capital, labor, technical progress), the importance of demand factors, the relation between agricultural progress and the Industrial Revolution, and the standard of living debate. The essays demonstrate that the application of fresh viewpoints to the literature has given us a considerable new body of data at our disposal, making it possible to test commonly held hypotheses. In addition, this new data has enabled economists to apply a more rigorous logic to the thinking about the Industrial Revolution, thus sharpening many issues heretofore blurred by slipshod methodology and internal inconsistencies.